This weekend, I stayed busy getting ready for the next Flavors of Carolina food show in Raleigh. That's tomorrow. I'm thinking this will be the last show I do for a while. Last Friday in Greensboro, I (along with a couple hundred other potential vendors) met with Fresh Market folks and received their introductory packet. It looks like they are changing up their model to focus more on local. I'm hoping that all of you will soon be able to purchase all 3 of our truffle products in their stores, at least from RDU to Charlotte. Whole Foods North Raleigh, March 24 from 1:00 - 4:00 pm (Their prepared foods area will be offering grilled chicken with truffle butter. Sounds great! If you are a fellow North Carolinian, you are enjoying some wonderful weather with us. I don't remember March ever being this beautiful. All kinds of trees are beginning to bloom, spring flowers are totally gorgeous and the weather forecast sounds better and better. Can it be true? Is winter all behind us? We've had snow storms in April before. I'm hoping it doesn't happen this year. 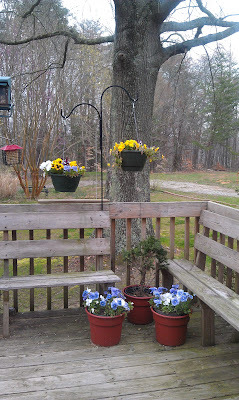 I heard the hummingbirds buzzing last week so I knew it was time to put up their feeder. The pansies have perked up a lot with the sunshine and warmth. The filberts and oaks are budding. Soon I'll be complaining about weeding and pruning again. Just be forewarned. It's also time to spread more lime and do some tilling. Rick just finished tilling in the new orchard this morning. I do love most aspects of spring, even though I know it signals lots of work. The link here for BunkyCooks has a great recipe included. Enjoy! Gwen Pratesi visited Tennessee Truffles and posted her visit on her blog. I thought you might like to read it. Ok, everybody -- go enjoy this beautiful day!